You have probably come across products referred to as suntan lotions, sunscreen or sunblock and you could tell the difference between them. The first question to ask is what suntan lotion is? Then probably, how does suntan lotion work? Even though the names sunscreen and suntan lotion are often used interchangeably, the two are somewhat different. Suntan lotion is a lotion used to increase tanning and generally, for indoor tanning. On the other hand, sunscreen, screen your skin from the UV radiation.As I stated earlier, tropical lotions that help your skin to tan are what are referred to as suntan lotions. You are less likely to find any product referring to itself as a suntan lotion. They usually have little to no sun protective elements. The SPF levels in these lotions are generally below 15. Some may even contain tanning accelerator elements. It is possible to get tanned by any of both, but tanning is faster using suntan lotions. What is sometimes categorized as suntan lotion? They both encourage the skin to tan but offer little to no protection from UV rays. A plus would be to use those with high SPF levels. Suntan lotion is designed to help improve your appearance by boosting your natural color and speeding up the reaction of your skin to exposure to UV radiation. You may find in the market a hybrid of a suntan lotion and sunscreen. These products can be referred to as either a screen or a tanning lotion.The cream comprises of a combination of organic and inorganic active ingredients. The natural ingredients used may include oxybenzone or octyl methoxycinnamate. These elements assist the skin in absorbing UV radiation. 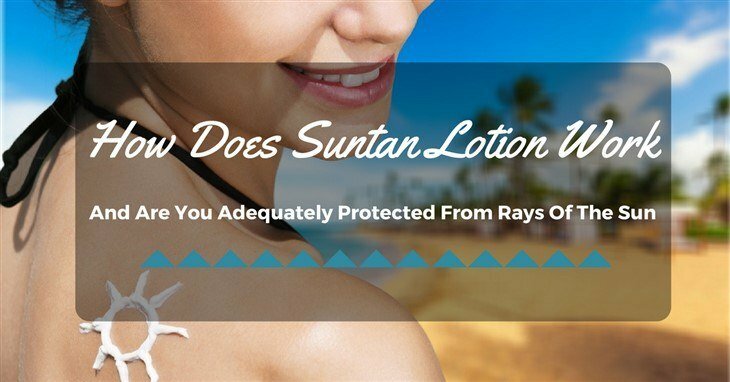 Suntan lotion provides you with the least protection from UV lights. The UV rays get absorbed into the skin which reacts by producing more melanin. For efficiency, it should be applied 30 minutes before you expose yourself to the sun. If you are perspiring or swimming in the sun, you will need to re-apply the suntan lotion regularly throughout the day. Suntan lotion with SPF encourages your skin to tan naturally while at the same time giving your skin some little protection from UV rays. The rays penetrate the lotion and create a nice brown tan. The emphasis of tanning lotions with screening properties is to control the exposure of your skin to UV lights. It is more important than actively filtering the rays, that’s why they mostly have low levels of SPF if at all any or not have it completely. UV-A: This wavelength of UV rays penetrates your skin fastest. It is not absorbed by the ozone layer and therefore, by staying in the sun for long periods, you will expose yourself fully to it. It is attributed to premature aging, causes wrinkled skin and also results in age spots on one’s skin. UV-B: UV-B penetrates the skin slower than UV-A, and is partially blocked by the ozone layer. It is responsible for causing sunburns due to overexposure to UV radiation. UV-C: You will only encounter this radiation from artificial radiation sources. It gets absorbed by the atmosphere, entirely. For protection against UV-A rays, you will need to buy a product that offers a broad-spectrum protection. SPF doesn’t measure the level of protection against UV-A. Always use a product with SPF, be it winter or cloudy weather. The harmful UV rays will penetrate through despite the weather condition. You may probably opt to get that brown glow more slowly than exposing yourself and live to regret your decision. If you are swimming, you should purchase a broad spectrum and waterproof suntan lotion for adequate protection. As you get your tan, you are not looking to get sunburn. For maximum protection, choose a product with a higher level of SPF. Suntan lotions have an SPF of 4, 8 or none. If you want to protect yourself from the harmful rays of the sun, then a sunscreen will do. Using a small to medium SPF level sunscreen will still result in a tan but at a slower rate. They allow a tiny amount of ultraviolet rays to get through. Skin experts emphasize the importance of knowing your skin type and how sensitive your skin is to sunburn and skin cancer. Use of suntan lotion is appropriate for those who already have a dark tan. 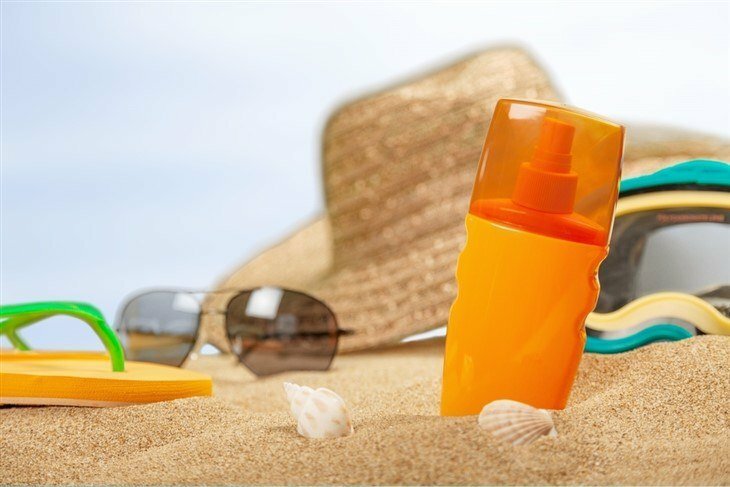 If you opt for a suntan lotion over sunscreen, choose one that is all-natural. It should contain Aloe Vera and Vitamin E; these components offer natural skin protection. They also encourage healthy skin cell turnover. You should probably use both a suntan lotion and sunscreen at alternating periods of time if you plan to spend many days exposing yourself to the sun. After exposure to the sun, apply cream with Aloe Vera and Vitamin E. They help in healing the skin at a cellular level. Products with low SPF levels or tropical tanning lotions are what are referred to as suntan lotions. The best response to your question, how does suntan lotion work is, by encouraging your skin to tan naturally while at the same time giving your skin some little protection from UV rays. It is so, for suntan lotions that have a Sun Protection Factor in their elements. Those without any SPF offer you no protection. Using sunscreen with low to medium level SPF will still lead to getting a tan but a slower rate. Exposing yourself to UV ray with little or no protection is not encouraged. You will be leaving your body open to all the effects of UV- and UV-B. They cause premature aging and burns, respectively. As you choose which method to apply to achieve that brown summer glow, remember to take care of your skin. If you are planning to have an outdoor expedition with your kids, can you use suntan lotion or tanning lotion on them? Kids have very sensitive and shouldn't be in the sun without protection. When in the outdoors, use sunscreen with SPF of high levels to screen the rays from their delicate skin. If they insist on getting tanned, you could let them have sunless tanning.